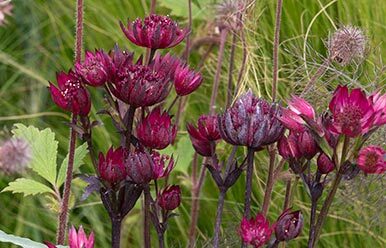 Astrantia are one of the harder working perennials in the garden and will often flower from June through to September; a perfect addition to herbaceous or mixed borders. Ruby Star has rich pink flowers opening from red-pink buds, which stand at 50cm, above their purple blushed foliage. Other varieties to look for are Astrantia major ‘Buckland’ that has soft pink flowers on stems 90cm tall or Astrantia major ‘Large White’ which as the name suggests, has large white flowers with green tips and again grows to 80cm tall. Avoid disturbing the roots of this plant as they can take some time to re-establish and mulch with a layer of good garden compost or manure in spring.